CCNP ONT Official Exam Certification Guide is a best of breed Cisco® exam study guide that focuses specifically on the objectives for the Optimizing Converged Cisco Networks exam (642-845 ONT). Successfully passing the ONT 642-845 exam certifies that you have the knowledge and skills necessary to optimize and apply effective QoS techniques for converged networks. 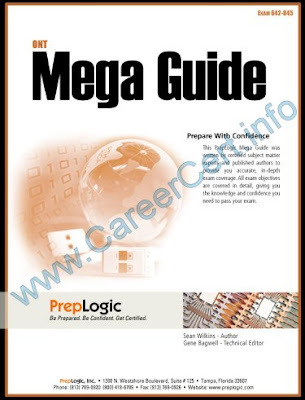 CCNP ONT Official Exam Certification Guide follows a logical organization of the CCNP® ONT exam objectives. Material is presented in a concise manner, focusing on increasing your retention and recall of exam topics. You can organize your exam preparation through the use of the consistent features in these chapters. “Do I Know This Already?” quizzes open each chapter and allow you to decide how much time you need to spend on each section. Exam topic lists and concise Foundation Summary information make referencing easy and give you a quick refresher whenever you need it. Challenging chapter-ending review questions help you assess your knowledge and reinforce key concepts. Preparing for the CCNP® certification? Working as a network professional? Here are all the CCNP-level commands for the ONT exam you need in one condensed, portable resource. 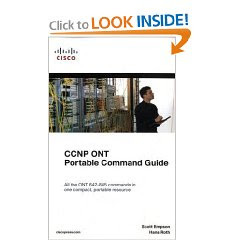 The CCNP ONT Portable Command Guide is filled with valuable, easy-to-access information and is portable enough for use whether you’re in the server room or the equipment closet. This book will help you memorize commands and concepts as you work to pass the CCNP ONT exam (642-845). The guide summarizes all CCNP certification-level Cisco IOS® Software commands, keywords, command arguments, and associated prompts, providing you with tips and examples of how to apply the commands to real-world scenarios. Sample configurations throughout the book provide you with a better understanding of how these commands are used in simple network designs. 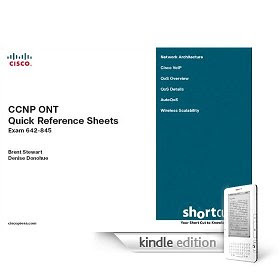 As a final exam preparation tool, the CCNP ONT Quick Reference Sheets provide a concise review of all objectives on the new CCNP ONT exam (642-845). This digital Short Cut provides you with detailed, graphical-based information, highlighting only the key topics in cram-style format. With this document as your guide, you will review topics on voice-over-IP (VoIP) networking, quality of service (QoS), IP QoS mechanisms for implementing the DiffServ QoS model, AutoQoS, wireless security, and basic wireless management. These fact-filled Quick Reference Sheets allow you to get all-important information at a glance, helping you to focus your study on areas of weakness and to enhance memory retention of essential exam concepts. With this document as your guide, you will review topics on implementing a voice-over-IP (VoIP) network, implementing quality of service (QoS) on converged networks, and implementing the DiffServ QoS model with specific IP QoS mechanisms, AutoQoS, wireless security, and basic wireless management. I can’t get the book. The link was removed. 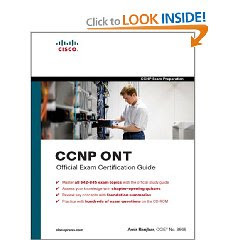 can we get Bryant ebook for CCNP ONT because he taught topic very concise and best way so pls if any body have post it. ONT student lab manual has been added. Link on eazy1.eazyupload.net doesn’t work!!! Please may you uplaod somewhere else?? ?